Because of the broad nature of this subject, this article is organized into 3 major categories. In the first section, infections of the lung are discussed, with a focus on bronchiectasis, lung abscess, and pneumatocele. Next, infection of the pleural space (empyema) is presented. In the last section, mediastinitis is covered. This review focuses on the surgical management of these infections. Bronchiectasis, defined as irreversibly dilated and damaged bronchi associated with chronic suppuration, was first described in 1819 by Roennec. In 1892, Sir William Osler recognized the role of bronchial obstruction and inflammation in the pathophysiology of bronchiectasis. Little changed for many years until the emergence of effective antibiotics and widespread immunization. For the past several decades, the incidence of bronchiectasis has been low. This condition is caused by repeated damage to the distal bronchi from inflammation or infection. Although the initial event rarely results in irreversible damage, repeated subsequent insults destroy the bronchial epithelium and peribronchial tissues. See the image below. 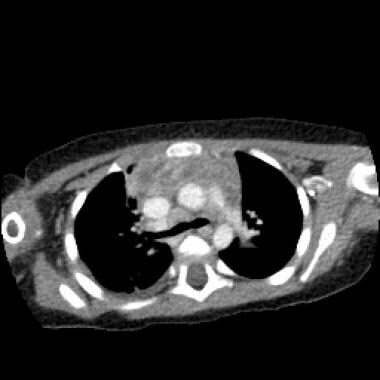 CT scan of a patient with bronchiectasis. Note that the bronchi fail to taper peripherally and that the bronchial walls are thickened. Also, the bronchus has a diameter larger than that of the accompanying pulmonary artery. Together, these findings form the signet ring sign. The primary treatment for bronchiectasis is medical and consists of a prolonged course of appropriate antibiotics, vigorous chest physiotherapy, and postural drainage. Children with cystic fibrosis (CF) and bronchiectasis require aggressive medical treatment, including careful nutritional monitoring, home physiotherapy, and, frequently, the use of inhaled aminoglycoside antibiotics, N -acetylcysteine, or dornase alpha (occasionally in combination). Preoperative evaluation commonly includes pulmonary function testing, nutritional assessment, and ventilation-perfusion scanning to determine if the affected area is contributing to gas exchange. This information allows the surgeon to remove the affected area by performing segmentectomy or lobectomy. Aggressive preoperative nutrition and respiratory therapy combined with early postoperative extubation and careful pain control all contribute to successful outcomes. Surgical intervention for bronchiectasis is reserved for children with localized disease and indolent, recurring infections, hemoptysis, persistent chest pain, and other indicators suggesting the failure of medical treatment. In a retrospective analysis of 260 Chinese patients who underwent surgery for bronchiectasis over a decade (2000-2010), Jin et al indicated that predictive factors for successful surgical outcomes included sputum volumes less than 30 mL, negative proof of Gram-negative bacteria, and bronchial stump coverage with use of the intercostal muscles or pedicle pleura embedding. The investigators noted that elderly patients should be monitored for complications. For children with CF, Schuster and Schwartz suggested the following guidelines for surgical intervention  : (1) a localized segment with disease advanced beyond that of the rest of the lung; (2) a bronchiectatic segment that is clearly irreversible; and (3) a patient who can tolerate thoracotomy and partial lung resection. The guiding principle for bronchiectasis surgery is to preserve as much of the lung parenchyma as possible. Complications after surgical resection for lung abscess are infrequent and include atelectasis, bronchopleural fistula, and wound infection. Follow-up care after hospital discharge consists of 4-6 weeks of antibiotic therapy, if the process is resolving, as shown on chest radiographs. Outcomes are generally good, and recurrences are rare. 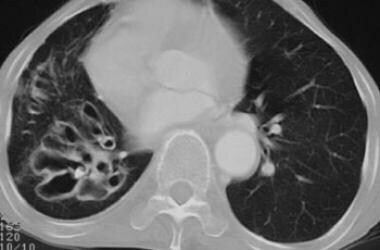 Lung abscess results from a serious suppurative infection of the pulmonary parenchyma. Its description was initially attributed to Bomnet in the 17th century. As with bronchiectasis, the development of modern antibiotics has markedly reduced the incidence of lung abscess. In children, aspiration is the leading cause of lung abscess particularly in those who have neurologic impairment, results from an infection of the lung parenchyma that was not or could not be effectively treated with systemic antibiotics, although necrotizing pneumonia (particularly Staphylococcus bacteria) may result in lung abscess formation. See the following images. 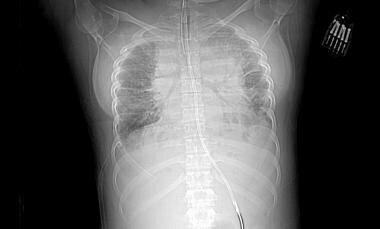 Lateral chest radiograph of a newborn with a left lower-lobe lung abscess. Note the cavity containing an air-fluid level. 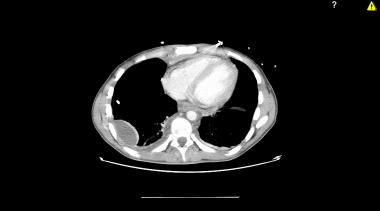 Chest radiograph that reveals a lung abscess, a complication of necrotizing pneumonia of the right middle lobe in an adolescent. 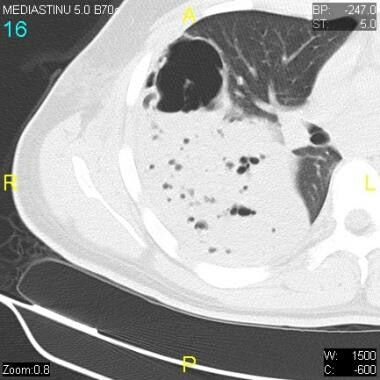 CT scan reveals a lung abscess with an air-fluid level, a complication of necrotizing pneumonia of the right middle lobe in an adolescent. Note several small pneumatoceles throughout the consolidated lung parenchyma. Effective treatment for children with lung abscess begins with obtaining appropriate cultures so that effective antibiotic therapy can be initiated. Bronchoscopy is useful when a child cannot produce an adequate sputum sample and to ensure that no foreign body is present. In the absence of cultured organisms, empiric intravenous (IV) therapy consisting of clindamycin or ampicillin-sulbactam is appropriate. If the child is toxic, empiric vancomycin and/or broadened gram-negative coverage may be required. When risk factors such as CF or immunocompromise are present, the addition of an aminoglycoside is warranted. As with any abscess, adequate drainage is essential to cure. Bronchoscopy is often used to open a bronchus occluded with mucus or sputum, allowing chest physiotherapy to provide the necessary drainage. In children with lung abscess, surgery is reserved for those in whom medical treatment fails. As previously stated, adequate drainage of the abscess cavity is an important factor in successful treatment. If bronchoscopy is performed, care must be taken to protect the unaffected lung and segments from spillover aspiration and contamination. 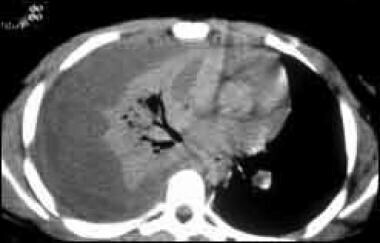 In abscesses that are relatively peripheral and well circumscribed, percutaneous needle aspiration and catheter placement under CT scan or ultrasonographic guidance is appropriate. 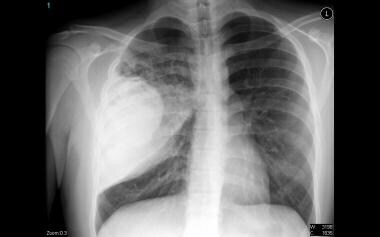 Pneumatoceles are air-filled cysts that develop in the pulmonary parenchyma, usually during the resolving phase of pneumonia. The thin-walled cysts may be single, but they are most often multiple. The incidence of a pneumatocele after pneumonia is about 2%. Overdistention of air spaces distal to a bronchiolar obstruction can result in a localized air collection termed a pneumatocele. See the image below. Because infants and young children account for most cases of staphylococcal pneumonia, pneumatoceles are most frequently found in this age group. 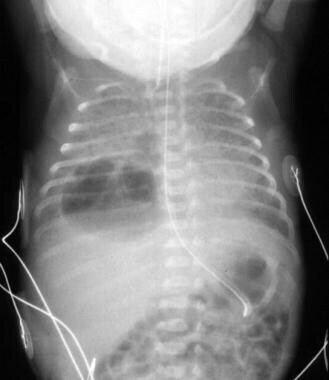 Right lower-lobe pneumatocele in an infant. In general, medical care of a pneumatocele is aimed at treating the underlying pneumonia. Treatment consists of antibiotics directed against the most common pathogens: S aureus and S pneumoniae. Positive-pressure ventilation should be avoided if possible because it can increase the size of a pneumatocele, a tension pneumatocele, or a tension pneumothorax. Selective bronchus intubation to aerate the good lung may be necessary to prevent these complications. Pneumatoceles are essentially a nonsurgical disease. Most spontaneously resolve in weeks to months. 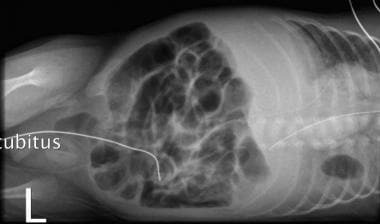 In rare cases, a life-threatening lesion, such as a tension pneumatocele or pneumothorax, prompts emergency percutaneous drainage. A secondarily infected pneumatocele occasionally requires drainage. These procedures are associated with the complication of bronchopleural fistula. Aggressive surgical resection of the affected lobe is rarely indicated. Since the 1970s, thoracoscopy has been performed in children, and, at present, thoracoscopic drainage with decortication is widely considered the standard of care in the management of empyema. Although pleural effusions most frequently occur in children with pneumonia,  empyema is a rare complication, occurring about 5% of the time. Several computed tomographic images of empyema follow. CT scan in a patient with right-sided empyema. Note the loculations in the lesion. Axial CT image of a 19-year-old adolescent with Ludwig angina, descending mediastinitis, and pleural empyema, demonstrating right-sided lung consolidation, loculated collections of pleural fluid on the right, and leftward displacement of the mediastinum. A left-sided aortic arch is noted. Axial CT image of a 16-year-old adolescent with group A streptococcal mediastinitis, demonstrating rim-enhancing fluid collections in the mediastinum, bilateral pleural fluid collections, pericardial fluid collections, and bilateral atelectasis. Thoracentesis is commonly recommended as part of the evaluation of a pleural effusion. When thoracentesis is performed, lactate dehydrogenase (LDH) levels exceeding 7500 mg/dL are associated with a need for surgical intervention. 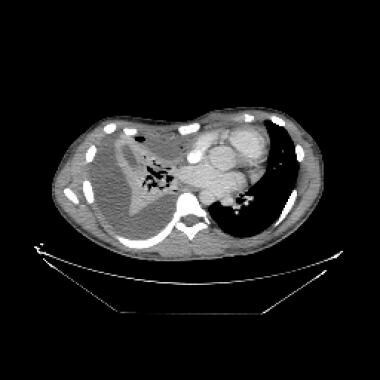 However, thoracentesis is unnecessary when a complex effusion is evident. Rather, the authors recommend that patients with loculated effusions be brought to the operating room for video-assisted thoracic surgery (VATS) (when available) with removal of the fluid and decortication if needed. If loculations are not found intraoperatively, a chest tube is placed. In institutions and/or circumstances in which VATS is not readily available or immediately appropriate, immediate chest-tube drainage is preferred to thoracentesis and delayed tube thoracostomy. Broad-spectrum antibiotic therapy should be started empirically and then refined when either sputum or pleural-fluid cultures are obtained. In addition, inhaled beta-agonists should be administered as needed. Chest percussion therapy and postural drainage also play important roles. Intrapleural thrombolytic therapy with streptokinase, urokinase, or alteplase has been successful in draining complex effusions in about 70-90% of patients. Similar to VATS, this therapy requires the placement of a chest tube. A blinded, 2-by-2 factorial trial demonstrated improved fluid drainage following treatment with tissue plasminogen activator (alteplase) in combination with DNAse, compared with either agent alone, resulting in reduced frequency of surgical referral and shorter hospital length of stay. Intrapleural thrombolytic treatment can be painful and often requires several applications. Therefore, the authors prefer to consider medical management only in patients for whom surgery or a general anesthetic is contraindicated. The mainstay of surgical therapy for empyema is drainage of intrapleural pus and decortication by means of a VATS procedure. The procedure is indicated in patients in whom an empyema is clinically diagnosed and in whom CT scanning or ultrasonography reveal a loculated fluid collection. No absolute contraindications are specific to VATS decortication. 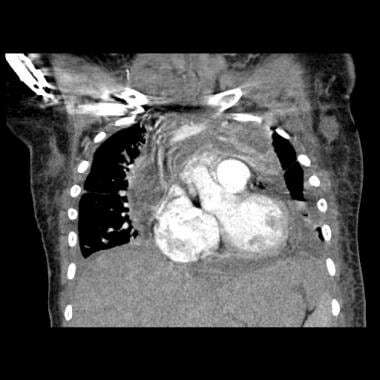 VATS can be performed in patients with previous thoracotomies or extensive intrathoracic adhesions; however, treatment of these patients should be reserved for surgeons with advanced thoracoscopic skills. The process of obtaining informed consent should always include a discussion about the possibility of thoracotomy. The boundaries of the pleural space are the visceral pleura, which envelopes the lungs, and the parietal pleura, which is the inner lining of the thoracic cavity. When performing a VATS procedure, one must be aware of the surrounding structures to avoid injuring them. In the superior aspect, the subclavian vessels lie just deep to the pleura. Medially located are the mediastinal structures, including (from anterior to posterior) the thymus and trachea, heart, phrenic nerve, aorta (on right), vena cava (on left), and the esophagus. Situated posteriorly and laterally are the ribs with their intercostal vessels and nerves. Also situated posteriorly is the sympathetic chain, and azygous vein is to the left. Inferiorly lies the diaphragm. The patient is intubated in a standard fashion. Single lung ventilation is rarely necessary, because the pneumothorax achieved with insufflation of carbon dioxide allows excellent visualization. The patient is positioned in the lateral decubitus position with the affected side up. An axillary roll is essential, and a sandbag may be used for support. Great care should be taken to pad all pressure points. The patient's chest is prepared with 10% povidone-iodine (Betadine) and draped. This should be done widely enough that a thoracotomy can be performed if necessary. Local anesthetic is injected subcutaneously about 2 cm inferior to the scapular apex. A 5-mm transverse incision is made, a Veress needle is placed, and a pneumothorax is achieved to 8 Torr by using carbon dioxide gas. A 5-mm trocar is then placed, and the thoracoscope is placed into the pleural space. A second 5-mm trocar is placed in similar fashion under direct thoracoscopic guidance in the anterior aspect of the chest at about the same level. A third trocar is usually unnecessary. The lung is gently compressed to achieve the best visualization and working environment. A suction-irrigator device is used to evacuate pus, and a specimen is sent for culture and sensitivity testing. The pleural space is then irrigated. The fibrin peel is removed in piecemeal fashion from the parietal pleura. Removing peel from the visceral pleura risks injury to the lung and is unnecessary. Throughout the procedure, the scope can be moved between the trocars as necessary for adequate visualization and decortication of the entire pleural cavity. The anterior trocar is removed, and a chest tube is placed through this wound and guided posterior to the lung to the apex under direct visualization. The lateral trocar is then removed, and the lung is re-expanded with positive pressure ventilation. The fascia and skin are closed with absorbable suture. The patient is typically extubated postoperatively, and the chest tube is placed to suction with 10-20 cm H2 O pressure depending on the size of the child. Over the last few decades, the care of children with empyemas has been controversial. However, most agree that patients with clinically significant pleural effusions require early drainage. 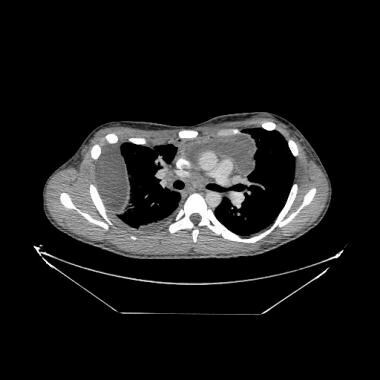 If an empyema appears complex on CT scanning or ultrasonography, the authors advocate drainage with a chest tube rather than starting with thoracentesis. Because appropriate sedation is required to place a chest tube in children, the authors prefer to do this in the operating room, starting with VATS. This step adds little time to the procedure and is an outstanding diagnostic tool. If an empyema is found, the adhesions are lysed, the collection is drained, and decortication is performed. Thoracotomy is rarely indicated. This management plan is supported in the literature and decreases the duration of antibiotic therapy, the duration of chest-tube placement, the number of invasive interventions per patient, and the total length of hospitalization. IV antibiotics, chest percussion therapy, and postural drainage are the mainstays of treatment after the procedure. The chest tube can usually be placed with a water seal on the first or second postoperative day if no air leak is present. The tube is then removed if the lung remains inflated 4 hours after water-seal placement. 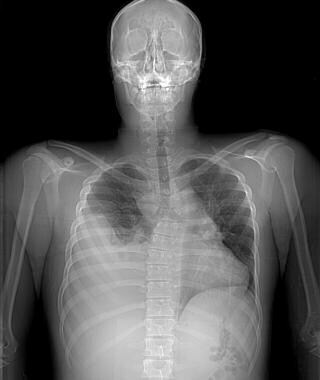 Chest radiography is obtained postoperatively. In general, findings on chest radiography lag behind the clinical picture; therefore, radiography is not meaningful in the short term, except to exclude a pneumothorax. 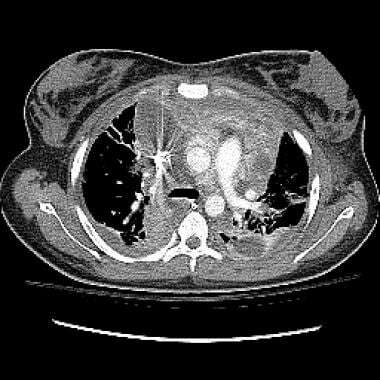 When VATS decortication is performed, the major complication to avoid is lung injury. 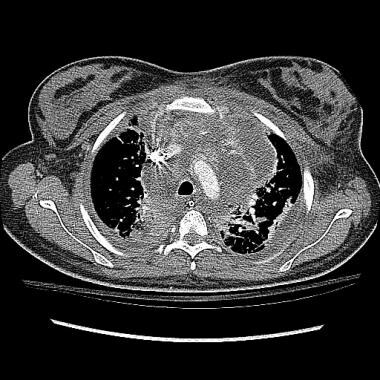 Lung injury can lead to a persistent air leak, which can substantially lengthen the patient's postoperative course. Other possible complications include injury to the thoracic duct, intercostal vessels, subclavian artery, and mediastinal structures. The best way to prevent these complications is the use of meticulous and careful operative technique. The prognosis of children undergoing VATS decortication for empyema is excellent. Most patients are ready for discharge within 3-7 days. The mediastinum is defined as the space from the thoracic inlet to the diaphragm situated between the pleural sacs of the lungs. The superior mediastinum lies above a line from the lower manubrium to the fourth thoracic vertebrae and contains the thymus, trachea, upper esophagus, and aortic arch. The inferior mediastinum may be subdivided into anterior, middle, and posterior sections. The anterior mediastinum contains fat and lymphoid tissue. The middle mediastinum comprises the heart, pericardium, aorta, carina, mainstem bronchi, and lymph nodes. The posterior mediastinum includes the esophagus, descending aorta, vagus nerve, and thoracic duct. Chest radiographs and computed tomography images of patients with mediastinitis follow. 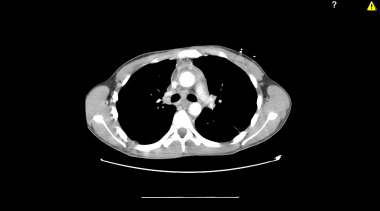 CT scan of the thorax of a sixteen-year-old with Lemierre's syndrome and anterior mediastinitis revealing pneumomediastinum posterior to and to the left of the trachea, free fluid surrounding the trachea, and left pleural effusion. 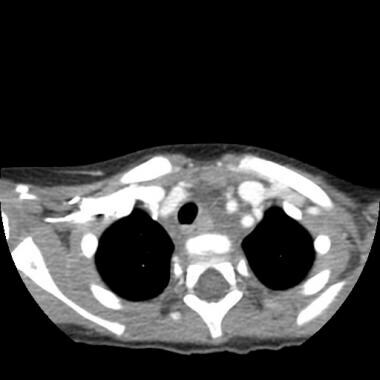 CT scan of the thorax with intravenous contrast of a sixteen-year-old with Lemierre's syndrome and anterior mediastinitis revealing development of ring-enhancing fluid collections in the anterior mediastinum just posterior to the sternum. 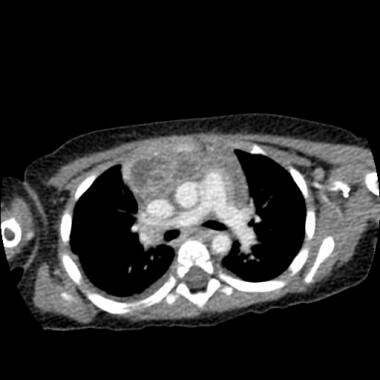 CT scan of the thorax with intravenous contrast of a sixteen-year-old with Lemierre's syndrome and anterior mediastinitis revealing a right pleural ring-enhancing abscess which persisted following drainage of an empyema. Coronal contrasted image from a 3-year-old child with retropharyngeal abscess/phlegmon and descending mediastinitis, demonstrating a hypoattenuated, phlegmonous lesion anterior to the spinal column, displacing the great vessels to the left and the obliquely sectioned trachea to the right. 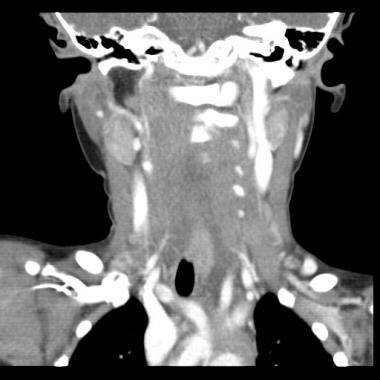 Sagittal contrasted CT image from the 3-year-old patient, demonstrating the retropharyngeal collection (widened prevertebral soft tissue) and vertical extent of the inflammatory process. 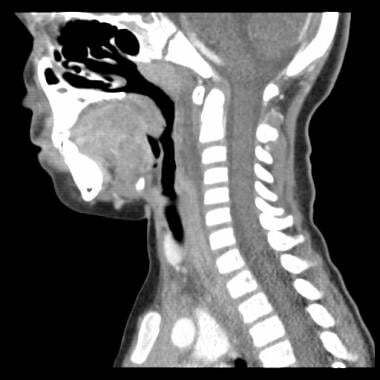 Axial contrasted image of the 3-year-old patient, demonstrating splaying of the great vessels and right-ward displacement of the trachea by the phlegmonous process. Chest radiograph (scout view) of a 19-year-old adolescent with Ludwig angina, descending mediastinitis, and right-sided pleural empyema, demonstrating a widened mediastinum, dense right basilar consolidation, right-sided pleural effusion, and leftward deviation of the cardiac silhouette. There is a left-sided aortic arch. Axial CT image of a 19-year-old adolescent with Ludwig angina, descending mediastinitis, and pleural empyema, demonstrating fluid collections in the mediastinum and loculated collections of pleural fluid on the right. A left-sided aortic arch is noted. 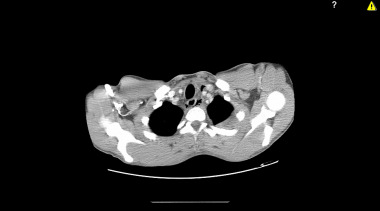 Axial CT image of a 9-year-old child with a retropharyngeal abscess and descending mediastinitis, demonstrating fluid collections in the anterior mediastinum. Chest radiograph of a 16-year-old adolescent with group A streptococcal mediastinitis, demonstrating a widened mediastinum. Coronal CT image of a 16-year-old adolescent with group A streptococcal mediastinitis, demonstrating rim-enhancing fluid collections in the mediastinum, bilateral pleural fluid collections, pericardial fluid collections, and bibasilar atelectasis. The cornerstones of treatment of mediastinitis are surgical drainage, broad-spectrum antibiotic therapy, and supportive care. Superficial median sternotomy infections with a stable sternum may be managed with local drainage and appropriate antimicrobial and supportive care. When deep mediastinal structures are involved, various treatment options are possible after debridement and drainage are accomplished and antibiotics begun. These options include simple closure, closure over drains, vacuum-assisted closure, bilateral pectoralis myocutaneous flap closure, other muscle-flap closure, and open management with delayed closure, among others. Sternal osteomyelitis is generally treated with antibiotics for 4-6 weeks. A flexible approach is required to manage mediastinitis associated with esophageal perforation or penetrating trauma. In general, the perforation should be drained, and gastrostomy and feeding jejunostomy should be accomplished. Mainstays of surgical management again include debridement, drainage, and irrigation. Drainage of the pretracheal space and superior mediastinum can be accomplished with a low cervical incision. A transthoracic approach is required to manage involvement of the inferior mediastinum (caudal to the fourth thoracic vertebrae). Perforation or laceration of the distal esophagus may be managed with transthoracic debridement, drainage, irrigation, and primary closure if it is attempted in the first 12-24 hours. Delay beyond this time usually precludes primary closure, resulting in the need for debridement and closure over drainage tubes. Thoracoscopy also has a role in the management of mediastinitis—but only in the hands of an advanced thoracoscopic surgeon. Its use may hasten recovery and diminish postoperative pain and morbidity. The approach to the patient with descending necrotizing mediastinitis should include wide local mediastinal debridement, drainage, and irrigation in addition to the use of broad-spectrum antibiotics. Tracheostomy to protect the airway is generally also required. The treatment of chronic mediastinitis is relatively troublesome. Antimicrobial therapy alone is seldom successful. Excision of involved tissues is often necessary to alleviate symptoms of compression. However, surgical intervention is seldom more than palliative, especially late in the course of the disease. Jin YX, Zhang Y, Duan L, Yang Y, Jiang GN, Ding JA. Surgical treatment of bronchiectasis: A retrospective observational study of 260 patients. Int J Surg. 2014 Oct. 12(10):1050-4. [Medline]. Schuster SR, Schwartz MZ. Surgical management of the pulmonary complications of cystic fibrosis. In: Pediatric Surgery, 3rd ed. 1979. Rothenberg SS, Kuenzler KA, Middlesworth W. Thoracoscopic lobectomy for severe bronchiectasis in children. J Laparoendosc Adv Surg Tech A. 2009 Aug. 19(4):555-7. [Medline]. Corcoran JP, Hallifax R, Rahman NM. New therapeutic approaches to pleural infection. Curr Opin Infect Dis. 2013 Apr. 26(2):196-202. [Medline]. Grijalva CG, Nuorti JP, Zhu Y, Griffin MR. Increasing incidence of empyema complicating childhood community-acquired pneumonia in the United States. Clin Infect Dis. 2010 Mar 15. 50(6):805-13. [Medline]. Rahman NM, Maskell NA, West A, Teoh R, Arnold A, Mackinlay C. Intrapleural use of tissue plasminogen activator and DNase in pleural infection. N Engl J Med. 2011 Aug 11. 365(6):518-26. [Medline]. Avansino JR, Goldman B, Sawin RS, Flum DR. Primary operative versus nonoperative therapy for pediatric empyema: a meta-analysis. Pediatrics. 2005 Jun. 115(6):1652-9. [Medline]. Stefani A, Aramini B, della Casa G, Ligabue G, Kaleci S, Casali C, et al. Preoperative predictors of successful surgical treatment in the management of parapneumonic empyema. Ann Thorac Surg. 2013 Nov. 96(5):1812-9. [Medline]. Alexiou C, Goyal A, Firmin RK, Hickey MS. Is open thoracotomy still a good treatment option for the management of empyema in children?. Ann Thorac Surg. 2003 Dec. 76(6):1854-8. [Medline]. Guan X, Zhang WJ, Liang X, Liang X, Wang F, Guo X, et al. Optimal surgical options for descending necrotizing mediastinitis of the anterior mediastinum. Cell Biochem Biophys. 2014 Sep. 70(1):109-14. [Medline]. Baldassari CM, Howell R, Amorn M, Budacki R, Choi S, Pena M. Complications in pediatric deep neck space abscesses. Otolaryngol Head Neck Surg. 2011 Apr. 144(4):592-5. [Medline]. Cohen E, Mahant S, Dell SD, Traubici J, Ragone A, Wadhwa A, et al. The long-term outcomes of pediatric pleural empyema: a prospective study. Arch Pediatr Adolesc Med. 2012 Nov. 166(11):999-1004. [Medline]. Cole S, Kearns D, Magit A. Chronic esophageal foreign bodies and secondary mediastinitis in children. Ann Otol Rhinol Laryngol. 2011 Aug. 120(8):542-5. [Medline]. Das S, Rubio A, Simsic JM, Kirshbom PM, Kogon B, Kanter KR, et al. Bloodstream infections increased after delayed sternal closure: cause or coincidence. Ann Thorac Surg. 2011 Mar. 91(3):793-7. [Medline]. Gao J, Wang YL, Lu SQ, Cai AB, Yang ZF, Han ZY, et al. Management of sternal osteomyelitis and mediastinal infection following median sternotomy. Chin Med J (Engl). 2010 Oct. 123(20):2803-6. [Medline]. Migliario M, Bello L, Greco Lucchina A, Mortellaro C. Descending necrotizing mediastinitis. Two cases consequent on odontogenic infections and a review of literature. Minerva Stomatol. 2010 Oct. 59(10):551-60. [Medline]. Park JS, Min JH, Kim H, Lee SW. Esophageal perforation and mediastinitis after suicidal ingestion of 4.5% sodium hypochlorite [correction of hydrochlorite] bleach. Clin Toxicol (Phila). 2011 Oct. 49(8):765-6. [Medline]. Sandu K, Monnier Y, Hurni M, Bernath MA, Monnier P, Wang Y, et al. Repair of tracheomalacia with inflammatory defect and mediastinitis. Ann Thorac Surg. 2011 Jan. 91(1):e14-6. [Medline]. CT scan of the thorax revealing an isolated right lower lung abscess in an otherwise healthy adolescent. The authors and editors of Medscape Drugs & Diseases gratefully acknowledge the contributions of previous author Matthew L Moront, MD, to the development and writing of the source article.